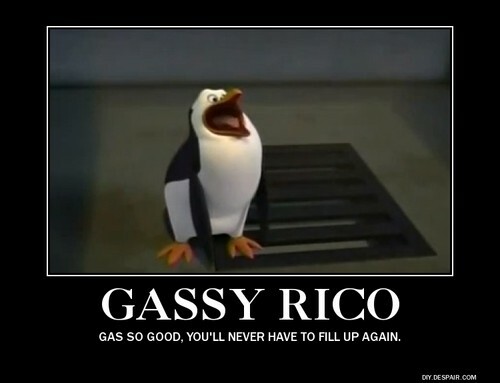 Gassy Rico Demotivational. I know I already uploaded the pic of belching Rico. But here is the demotivational.. HD Wallpaper and background images in the पेंग्विन्स ऑफ मॅडगास्कर club tagged: penguins of madagascar penguin rico belch. This पेंग्विन्स ऑफ मॅडगास्कर fan art might contain रॉक हॉपर, कलगी पेंगुइन, क्रिस्टेड पेंगुइन, रॉक हूपर, and कलगीदार पेंगुइन. *urrp* Confound this *urrp* image it made me *urrp* start burping *urrp* excuse me. Pinkie: *starts laughing* Now do one with one of them sneezing. You trying to *urrp* ,excuse me, make my brain turn to mush? Pinkie: It's fun to see you like this. Rarity: So... disgusting and who's idea was to give him 30 years expired kippers, mixed with polish sour crout, chopped onions and 3 million times used kitty litter?!? Octavia: *hides the mix* Yes, definitely not me!